As evidence by both written records and the items placed in the tombs to travel with the deceased beyond life in the body, the ancient Egyptians were a culture who highly valued care and beautification of the physical body. This emphasis on body care is still famous today, with the legendary association of Cleopatra as one of the most prominent, and possibly the first, beauty icon in world history. In Egyptian society, a well kept body was considered a very important fundamental focus for all social and economic classes and was equally valued in men and women. Indeed, Egyptians from all walks of life were knows to oil their bodies every day and body oil was a mandatory form of payment for workers wages. Information about treatments used in ancient Egypt include treatments for hair loss, stretch marks, and extensive care to prevent body odor and infuse pleasant aromas in the skin, hair, and clothing worn. Their use of fragrance in body care extended beyond the everyday hygiene uses and was also an important component of ritual practices in temples and burials. In fact the cosmetic trade was one of major uses trade routes between Egypt and other places around the world. Cleopatra VII, last of the Ptolemies, apparently wrote an entire book about beauty and body care methods, for which she was an expert. 1) Milk and Honey- This is perhaps them most famous beautification practice of Cleopatra. Whether she bathed in these ingredients or applied them as a mask, these ingredients contain properties highly beneficial to the beauty and youthfulness of skin. Milk contains alpha hydraulic acid which acts as a gentle exfoliant to the skin. The benefits of applying honey to the skin are numerous. Honey has such powerful anti-microbial properties that honey produced hundreds or thousands of years in the past can still survive to the present in tact and edible! For this reason honey is excellent for wound healing or acne. Honey is also a humectant which means that it holds in moisture. In combination with honey, the skin would be softened, moisture would be allowed in and then the honey would hold in the moisture and preserve skin. This is definitely a luxurious beauty treatment to work into a beauty regimen. 2. Natron and Water- Natron is another word for naturally occurring sodium bicarbonate (baking soda). Amazingly, so many staple foods and cooking supplies already on hand around the house are some of the safest and most effective substances for skin beautification. Egyptian women would mix Natron with water into a paste which would be applied as a mask. Baking soda or Natron gently exfoliate the skin leaving it soft and very smooth. Exfoliated skin absorbs other treatments more effectively. The Egyptians knew what they were doing! 3. Aloe Vera- Aloe Vera, a succulent plant native to Africa, is know the world around as one of the most amazing substances for skin healing, improvement, and beautification. Aloe vera contains an exceptionally high amount of nutrients, amino acids, and beneficial properties that are tightening, healing, calming, and moisturizing for the skin. A whole aloe leaf from the market or a house plant can be cut, then the skin sliced off and the ‘filet’ of inner sticky flesh rubbed directly onto skin and left on as long as you wish. This treatment is excellent for sky wrinkled skin or acne prone skin. It is amazing for all skin types. 4. Frankincense- Frankincense is obtained from the sap of a tree native to North Africa. 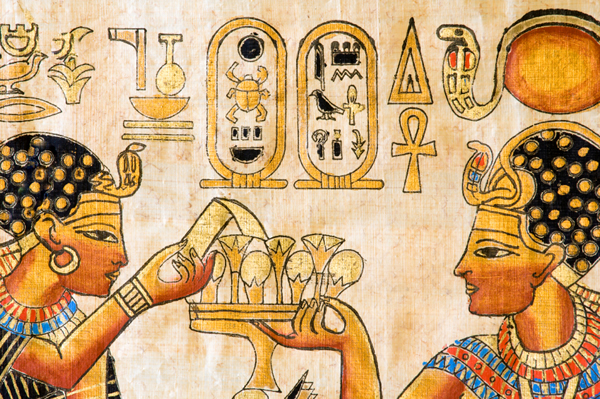 For Cleopatra’s anti-aging skin elixir, archaeologists have managed to obtain the actual written recipe used. Gum of Frankincense was added to wax, moringa oil, cypress grass, and fermented plant juices. Unfortunately we don’t know exactly what those plant juices were or how they were fermented and nor do most of us have access to moringa oil or cypress grass, but frankincense essential oil is easily obtained. As a base substitute sweet almond oil could be used, though bitter almond oil was actually an ingredient ancient Egyptians more readily used in skin formulations. This can be applied nightly to sleep in and absorbs nicely. 5. Honey Sea-Salt Scrub- The Egyptians would have utilized dead sea salt for this one, but if no dead sea salt is available, it would be effective to use pink himalayan salt or any natural un-processed sea salt. Again, honey is used in this recipe with the final ingredient being a reappearance of natron again- baking soda. These three things can be mixed together in roughly equal parts and were used to scrub the entire body. Scrubs stimulate the lymphatic system, increase blood flow, slough off dead skin, and help nutrients in the scrub be absorbed into the skin. Remember to use raw honey as it contains active enzymes that cause it to me more effective and beneficial. Enjoy trying these ancient beauty secrets that have the stamp of approval from ancient Egypt’s most beautiful historic royal woman.